The TÜV of my Fiat Tipo was due in a half year and the necessary investments for the acquisition of this quality seal would not be insignificant. All tires (including spare wheel) were nearly profileless and three of the tires had been patched already (195mm tires can pick up lots of screws and nails), the sound of the engine increased day by day because of a burst 'flame tube' (it did not know at all that my little Italian had something like that) and finally the rust at the undercarriage couldn't be ignored by the technical inspectors (nevertheless it was the first Fiat series galvanized at this area). I could ignore little things like defective ABS sensors and really unhandsome rims (nevertheless from aluminum) since I had bought the car 4 years ago. The normal repair would exceed the current value clearly. The following days I watched out for a suitable object and found one in Darmstadt. The fact that the framework was rusted through and had to be exchanged and that the rust gnaws at the little house could be seen clearly. 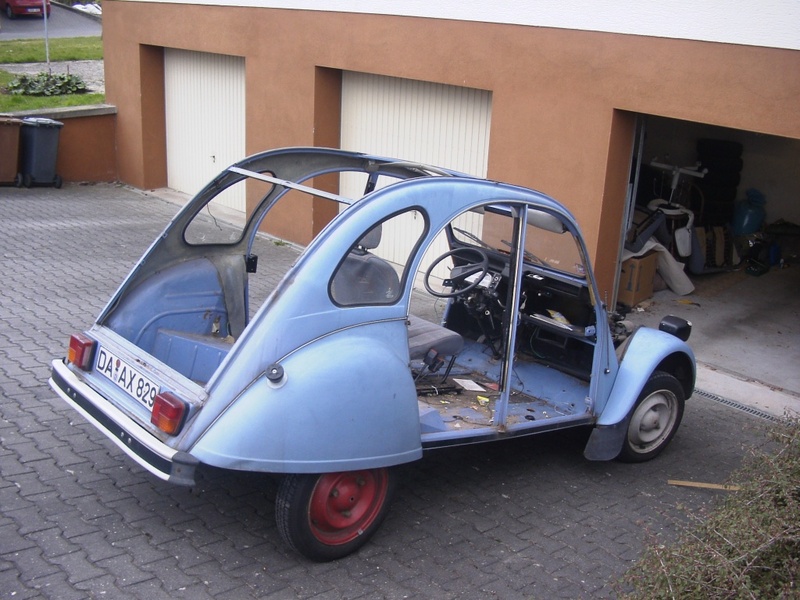 The engine started immediately, worked audibly (between front and rear silencer wasn't a continuous connection), but perfectly and brought the 2 CV up to speed with the help of the well switching transmission. Marking the district with some oil drops, was a attribute which several of my previous vehicles possessed. 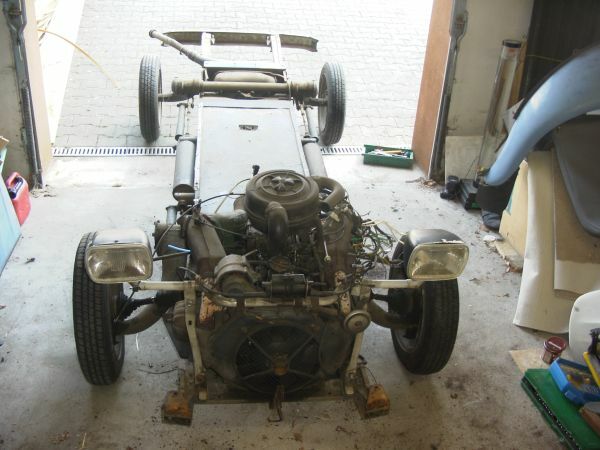 It took 900,- Euros to make it mine, so at least condition number two was fulfilled. 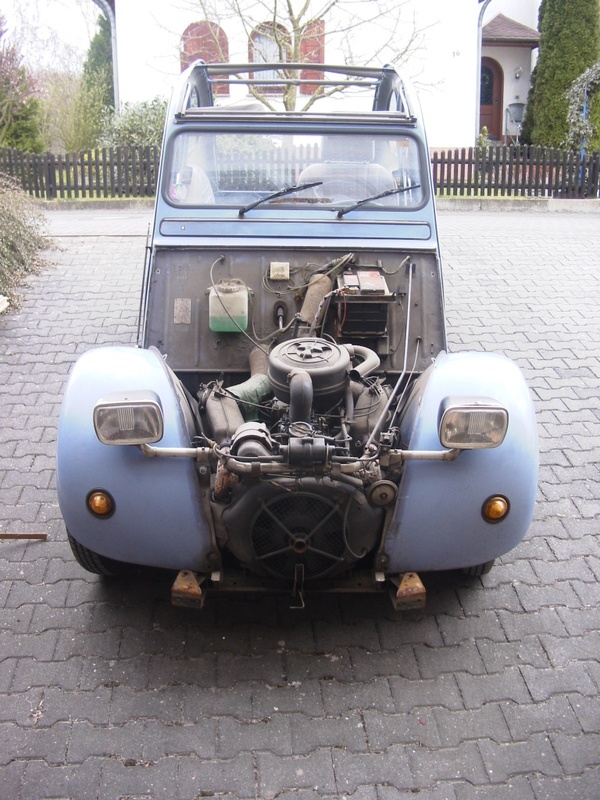 3 months of TÜV should be sufficient to do the framework exchange (there are only a few screws to be loosened). Of good cheer, but with low speed (the 113 horses of my Fiat were somewhat more powerful) I drove home in stormy rainy weather. 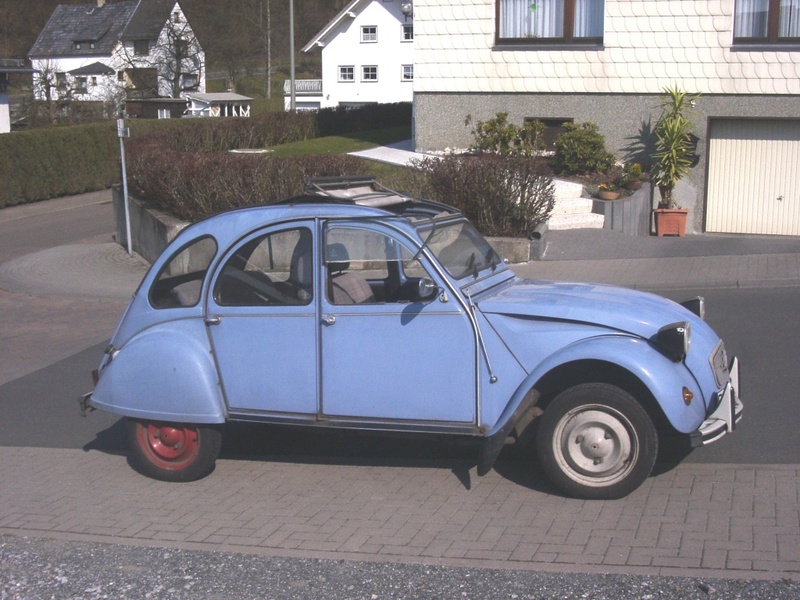 The previous owner let me pass with his homologation and so I had the pleasure to drive a 2CV for the first time approx. 80km long with steadily more largely becoming trucks in the rear mirror. At the following weekend I started the project. Hood, trunk lids and the rear doors are fastly shifted out. The hinge-joints of the front doors loosened and passenger seat and backseats taken out. Now driving out of the garage by own engine power for the last time and shooting some photos. I could have unmounted the front fenders also, but somehow I thought these construction units had a static function. Meanwhile I know better. Next I took a gasoline can in order to transfer the valuable juice to my Fiat. When I went towards the duck with the can in my hand, my neighbour Klaus past by and said: 'You're right, set this thing to fire.' I was too astonished to give an answer before he disappeared in his house. 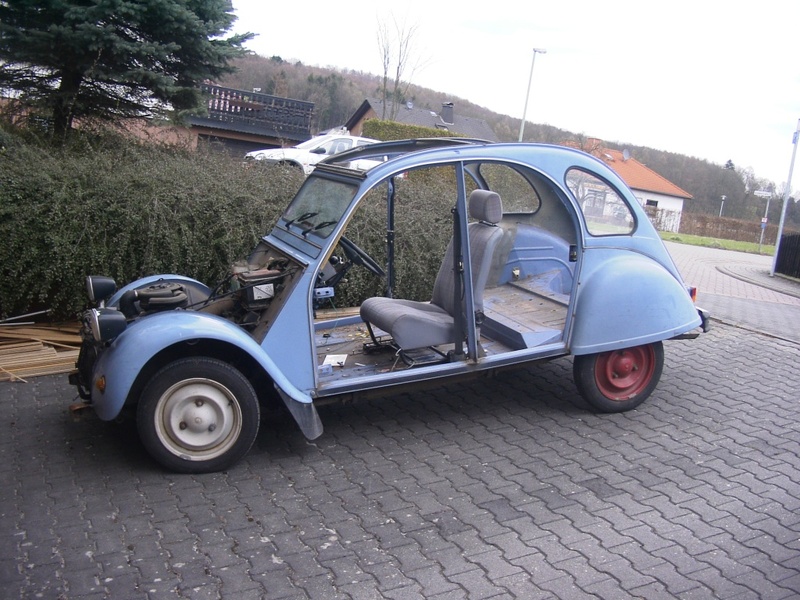 The whole thing wasn't really seriously meant and Klaus supported me in the following with my restoration efforts. In front of the garage I digged the waste out of the car. My new acquisition wasn't really check book and washroad maintained over the past months. Probably a squirrel had its winter accomodation here at last, I can't explain the existence of so many hazlenuts in every corner of the body somehow else. So far so simple - the screws of the body attachment offered partially embittered resistance then, so some of them lost their heads. Rust remover and soldering lamp should be allways readily to hand. The last tool should not be used near bearings and seals, since they do not withstand the heat. Otherwise you can force rusted screw to rotation again, particularly within the exhaust pipes. The last tool to use is the angle grinder - when assembling the car you should use stainless steel screws and nuts anyway. It's also very advisable to loosen the screws always anticlockwise (I sometimes confounded that...). The most usual screw size with the 2CV is M7 in different lengths to process with a 11mm wrench. Stupidly you can't by those screws in every do-it-yourself store. Apropos do-it-yourself store - with the tool, chaff and wheat separate fast when loosening rusty screws. Good tools are to be prefered to the sale of the century. Here thanks at Ferdi, who supported me from time to time with his 'man tools'. If all screws of the body attachment are loosened, the body sticks usually still quite firm at the framework. The foam rubber tape between these construction units, which prevents the friction and thus the rust accumulation, is responsible for this. Here you need pure muscle power. 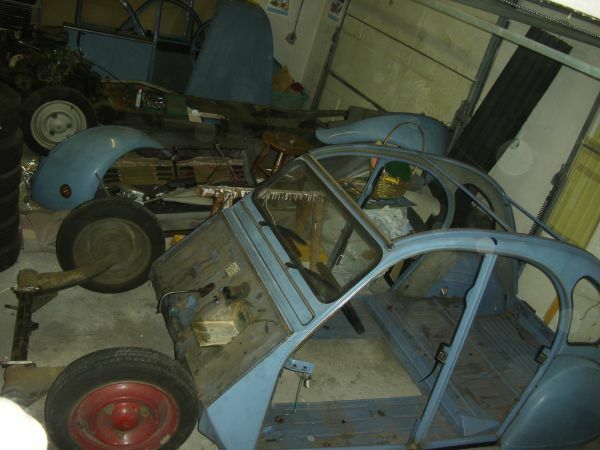 Sometimes I had to study the 2CV-Forum, in order to separate some parts, but it preceded briskly at all. 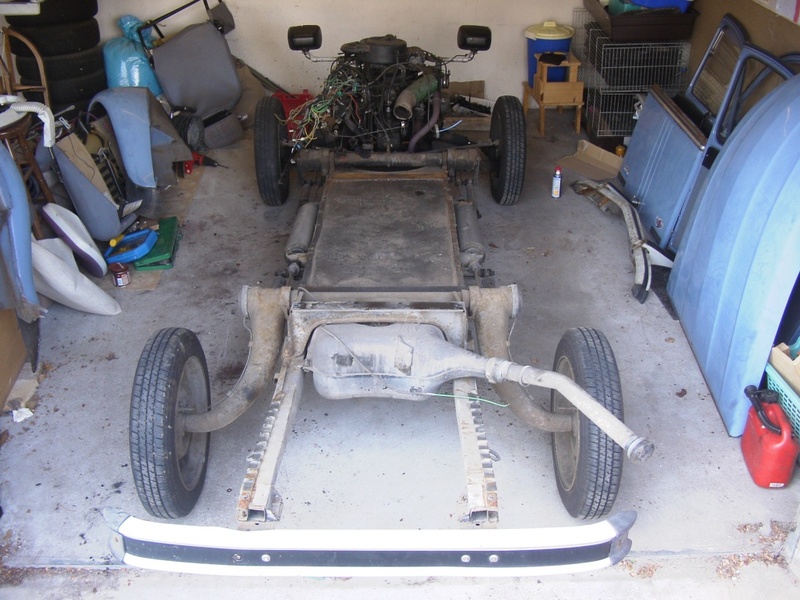 I explained the disassembly of the critical parts more exactly at the column 'assembly'.